Astronomers have come across a peculiar phenomenon after observing a distant dying star that sheds matter in a three-dimensional spirally pattern due to pulsations at its core. This is a totally atypical behavior, which scientists have yet to encounter before, one that might shed new light on star evolution. The red star called R Sculptoris, located 1500 light years away in the constellation of Sculptor, is currently at the last stages of its life, shedding shells of matter, driven out by solar winds created by the high temperature gradients at its core. The matter blown out will accumulate into planetary nebulae over the course of million of years, which provides the basic material for other stars to form – a universal cycle. However, R Sculptoris doesn’t simply shell out material, it does it in 3D spiral, and while the exact mechanics of this behavior have yet to be resolved, we as simple observers can only rejoice at its beauty. The astronomers used only half of the 66 high precision antennas of the Atacama Large Millimeter/submillimeter Array (ALMA) observatory to peel through the guts of the star. 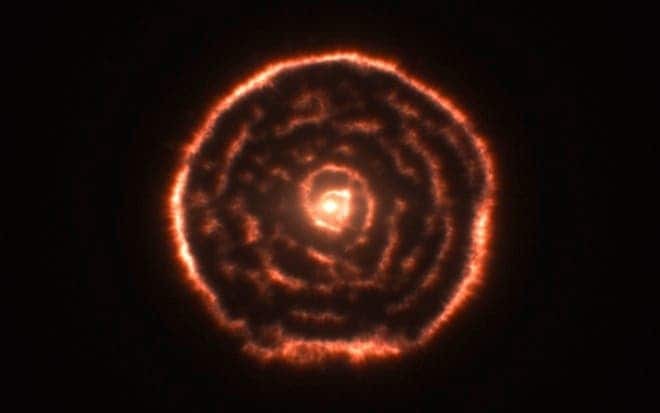 Everybody was surprised at what they saw – “we’ve seen shells around this kind of star before, but this is the first time we’ve ever seen a spiral of material coming out from a star, together with a surrounding shell,” said Matthias Maercker, from the Argelander Institute for Astronomy, University of Bonn, Germany. Further observations of R Sculptoris show that it suffered a thermal pulse event some 1800 years ago that lasted for about 200 years – a thermonuclear convulsion that happens deep in the star’s core. At his stage during a star’s last moments, helium fuses into heavier elements, releasing a great of energy in the process, while also causing a shedding of high density material from the red star’s atmosphere. But why the spirally pattern? Well, the astronomers’ best bet is that the phenomenon is triggered by a neighboring, high proximity star, whose gravity drives matter away. This hasn’t been confirmed though, since such a star has yet to be observed. “It’s really gratifying to see this new view of a process that we’ve known about for some time but never seen in such detail,” said astronomer Mark Morris of UCLA, who was not involved with the work. R Sculptoris is important for many reasons. For one, it provides real data the researchers can use to compare with their computer models of red star late stage matter outflow. They already found, for instance, that more material is blowing out than was expected from simulations. Also, R Sculptoris is very similar to our sun, and most likely it will suffer a similar fate 5 billion years in the future when it’s expected to collapse. Below you can watch a video that exhibits the internal structure of the star, showing slices through data taken at a slightly different frequency. Findings were reported in the journal Nature.